I’m going to be honest with you: I’m kind of getting sick of pumpkin ales. They taste violently of pumpkins and I can only take so much of it. And why JUST pumpkins? Come on guys, there are more ways to celebrate the season than with the flavor of pumpkins! Like….candy corn beer. Ugh, never mind. Talked myself out of that right quick. Luckily for me and my sudden bitterness toward pumpkin ales, The Great Pumpkin Ale is nowhere near as strongly flavored as the truly awesome Pumking. It has a strong, spicy smell that’s immediately no better or worse than any of its cousins. And the first taste gives you a strong burst of spice flavor, but not a lot of pumpkin flavor. It’s the finish that makes this a more dissatisfying beer, pumpkin ale or otherwise. It just kind of…stops and leaves you hanging with a kind just-there aftertaste. It feels…incomplete. I made Emily try some while she was eating some pumpkin bread (that I baked myself) and she said it was really good. So! 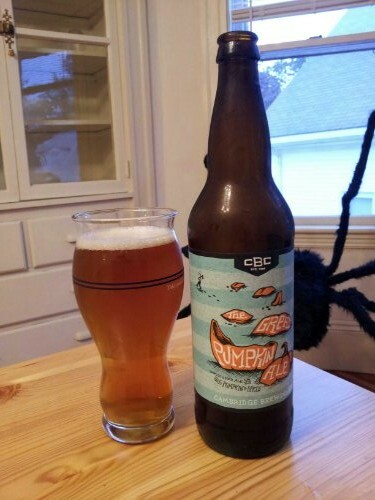 If you want a good beverage to go with your pumpkin based foods, go with The Great Pumpkin Ale. Its less in-your-face pumpkintude will complement your meal with aplomb! I give it a Charlie Brown Halloween Special.